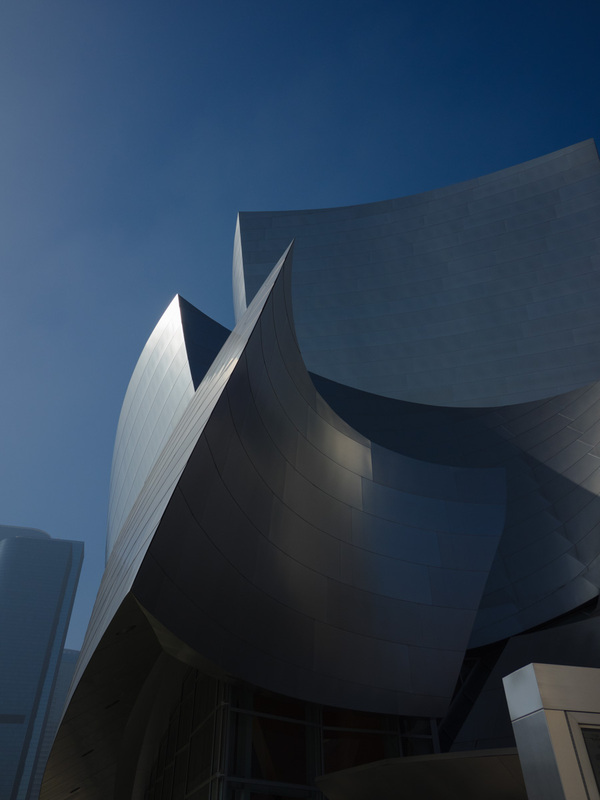 This is a picture of the Walt Disney Concert Hall in Los Angeles, California. The building was designed by Frank Gehry and completed in 2003. The design involves so many different shapes, textures and patterns that you could spend days (or more) shooting the building at different times/different angles and continue to come up with unique images. When I visited LA earlier this year I only had a short amount of time to shoot the build. As a result, I got a series of shots that I really liked, but they also had a certain sameness to them. The sky was clear blue, the angle of the sun was always the same, etc. When I was shooting the building, I had my camera configured to shoot square format in black and white. However, when I ended up processing some of the images, I decided to change things up a bit. The main changes I made to the image were to add some toning and some additional texture. The building itself already has a texture of its own. The overlapping plates create one element of texture, but the plates themselves have a subtle texture as well. The sky in the image, however, was a smooth blue. 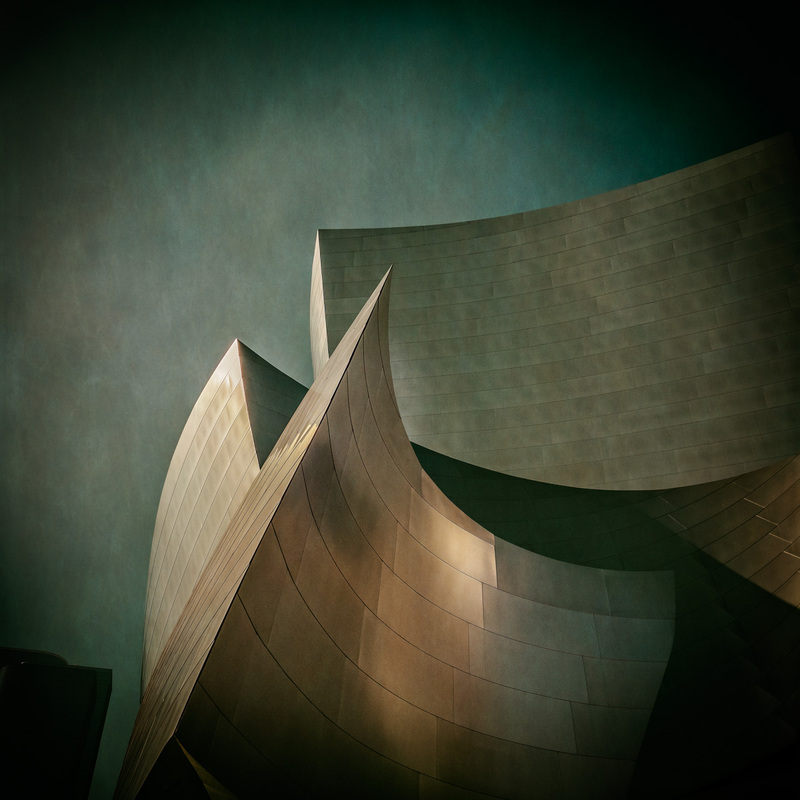 On of my favorite photographers that I’ve been following on Facebook and Flickr for years is Julian Escardo. He often posts images which have this sort of tonality shift. While my intention was not to copy any of his work, I did want to see what would happen to this image if I applied a bit of toning. Initially I used Analog Efex Pro by Nik Software to provide the toning. I liked the warm tone that it gave to the building and sky. However, as I looked at the image, I thought it needed something else. I wanted to give it a bit more texture, so I used a ‘rice paper’ setting in Perfect Effects by onOne. After playing with the color and opacity, I came up with the final image that you see above. Below, you can see the raw image as it came out of the camera. Glad to see you made it to one of my favorite buildings! Great work! Thanks! This is definitely a building that I want to come back and spend more time shooting. So many ways to shoot and it looks different at different times and weather conditions. Very cool building, glad you enjoyed the image.